Key Person Coaching works on a fuller, more long-term brief than Executive Coaching. While the work is headed up by a dedicated coach, it is not strictly one to one work. This part of the programme would follow a similar pattern to executive coaching, but with an added dimension to incorporate a larger need to look after the organisation's need for the Key Person's development in line with organisational aims and goals. 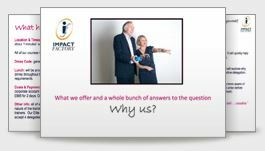 Combining One to One work with places on Impact Factory's extremely effective professional development courses will broaden the development potential of the Key Person in line with the objectives established in early consultations. Here the thinking is to source relevant courses from preferred non-Impact Factory suppliers to fast-track the client's development in line with the individual's and organisations needs. These placements could range from Prince2 Training or Language Study, through to some form of Outward Bound experience or even Dance Training. The idea here is to increase the Key Person's confidence as well as their competence, thus making them both effective and motivational. To help embed change, growth and development in the individual and the organisation we will tailor internal events designed to bring together everyone whose input or action is needed.